It’s no secret that chemicals are everywhere, especially in our personal care and beauty routine. By the end of her daily grooming and make up routine, the average woman will have added a staggering 515 chemicals to her body. 13,000 chemicals are used in cosmetics alone, but only 10% of them have been evaluated for safety. Several of these dangerous chemicals are lurking in your antiperspirant deodorant. Cosmetic companies–even the “natural” ones–are prone to deceptively represent their products, yet sell them effectively with creative advertising. This means it’s our job to become aware of what we are putting on our bodies, and an easy place to start is with our antiperspirant deodorant. What’s the Big Deal with Antiperspirant Deodorant? Antiperspirant deodorants have been heavily examined in the past few decades. Marketing slogans inspire you to believe their promises of confidence, masculinity, and empowerment from buying their product, but there’s a host of disturbing chemicals inside the packaging. Aluminum compounds are the active ingredient in antiperspirants to prevent sweating and eliminate odor. While aluminum is a naturally-occurring chemical, it can reach high levels of toxicity in humans. The European Food Safety Authority found that many individuals have up to 13 times the tolerable amount of aluminum in their bodies! Aluminum is a neurotoxin, meaning it is toxic and degenerative to the nervous system. It travels to the brain where it causes disorientation, memory impairments, and plausibly Alzheimer’s Disease. Exposure also contributes to bone disease, renal complications, and anemia. Additionally, aluminum is linked to breast cancer. One study found that an increasing number of breast cancer discoveries are located in the upper outer quadrant of the breast, which is a local area of deodorant application. Another study links frequency and early use of deodorant with an earlier age of breast cancer diagnosis. The scary correlation? Aluminum from deodorant is absorbed through the skin at a rate of 1-6%. The Material Safety Data Sheet cautions that skin contact with TEA and DEA can be harmful, produce chemical burns, and inflammation. Prolonged exposure can result in kidney, liver, and nervous system damage and tumor formation. While deodorant companies boldly advertise 24-hour coverage, The Cosmetic Ingredient Review Expert Panel recommends brief or discontinuous exposure to TEA and DEA followed by thoroughly rinsing and removing it from you skin. The European Commission has banned TEA and DEA due to it’s toxicity. Their research confirms links to cancer, negative affects to male reproductive health, and kidney and liver toxicity. Links to tremors and memory function are also under evaluation. Propylene Glycol (PG) is a substance that absorbs water. In antiperspirants, it wicks away sweat. Although its generally regarded as safe by the FDA, evidence continues to suggest otherwise. One study found substantial nerve cell death from PG and strongly recommended an alternative substance be found. PG is also a common skin irritant and can result in dermatitis for those with sensitive skin. Phthalates are one of the most abundant chemicals we interact with daily. It’s in our food, water bottles, PVC pipes, toys, and even in medical equipment like IV bags and tubing. Also hiding under the names “fragrance” and “perfume” in our deodorant, phthalates help dissolve and marry the chemicals in deodorant for that smooth roll-on. It also helps the fragrance literally stick to your underarms. The evidence is rising against phthalate safety through studies on lab rats. Phthalates interfere with hormonal systems: blocking hormones in females and causing low testosterone, sperm count, and reproductive disorders in males. A recent study classifies phthalates as a reproductive toxicant and hinders fertility by specifically targeting the ovaries. Birth defects, cancer, and diabetes also stem from phthalates. Save Your Pits–Make the Switch! While we absorb only small amounts of these chemicals every day, many of us apply antiperspirants every day for decades. This routine often starts in our teen years or younger and continues until we are elderly. Small but constant infiltration of these chemicals eventually build up the same way cholesterol eventually blocks our arteries after years of eating too much bacon. Are you sweating yet? Are we rolling on disease instead of that refreshing Powder Fresh or Old Spice scent? But wait, don’t men and women need a different deodorant? In short, no. Research confirms that “men sweat more and begin sweating at a lower body temperature than women.” However, the salt and water content of men’s and women’s sweat are basically the same. So, sweat is sweat. And… deodorant is also deodorant! The active ingredients in men’s and women’s deodorants are the same. The biggest difference is the scent (not to mention marketing schemes). 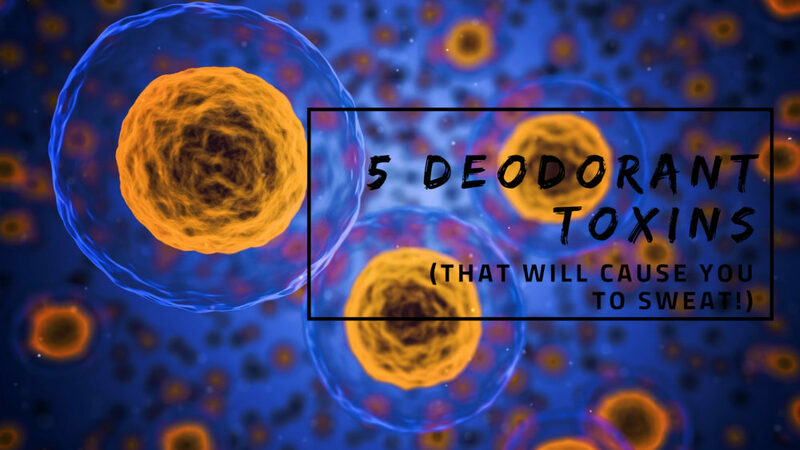 While your new deodorant may not have that perfumed punch to wake you up in the morning, you’re eliminating tons of daily toxins while still bearing a pleasant scent. Not a bad trade! Men, have no fear! “Natural” doesn’t equal “feminine” in the scent department. Look into Sam’s Natural Deodorants for lots of favorable scents plus a sports stick for optimal sweat concealer. We are creatures of habit. It takes mental work to let go of our favorite products and make a switch. But after reading the long list of disease-laced ingredients we use every day, the choice can be a bit easier. Let’s stop slowly poisoning ourselves and choose a happier alternative! Breakfast is the most important meal of the day, but are you really giving your body the nutrients it needs? Or worse, are you filling up on toxic chemicals while trying to get that recommended serving of whole grains? Breakfast cereal is one of the greatest things since sliced bread. But building evidence suggests that breakfast cereals can be one of the worst things to serve your family. If we actually knew the ingredients in our food—or even pronounce them—we would be very distrustful of the food industry. Knowing this, the food industry has several tactics to keep consumers in the dark. GRAS – countless items in our foods contain ingredients that the FDA has deemed “Generally Regarded As Safe”, or GRAS. In reality, many of these substances are not safe. The system allows quick approval of substances without thorough scientific evaluation and assessment. A substance is deemed GRAS if it is safe when used in its intended amount; however, there is no regulation for the actual quantity used in food once it receives its seal of approval. Prizes, box toppers, and characters – it’s a well-known strategy to use popular characters, designs, and prizes to entice children and adults alike into buying the product without evaluating the ingredients. If there’s nutritional reassurance of vitamins and whole grains and the prize makes my child happy, the rest can’t be that bad, right? As consumers, we must educate ourselves when it comes to our food. This especially applies to processed food. The food industry profits from too many loopholes and cover-ups, not concerned at all that their products make their consumers sick. Breakfast foods are not exempt from the processed food list. And some of the chemicals found in the cereals we give our children may shock you. TSP is a heavy-duty cleaner for removing mildew, mold, and grease, often before painting walls. Ingesting TSP results in abdominal pain, a burning sensation, and even shock and collapse. The CDC recommends avoiding all exposure to it, and a quick Google search yields many how-to alternatives because TSP is so toxic. 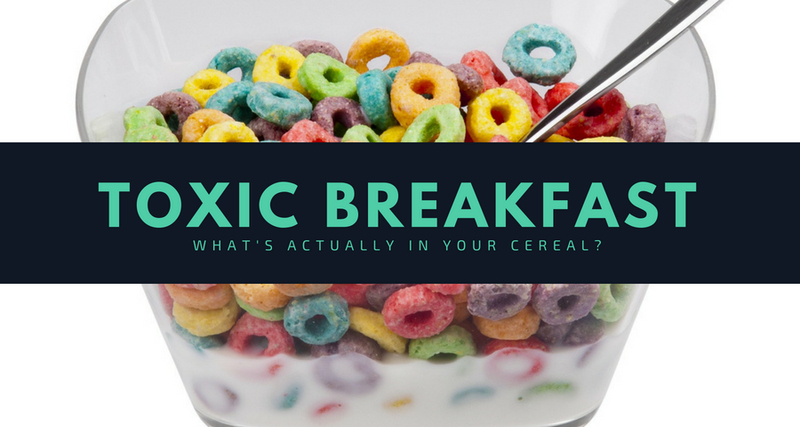 So why is this toxic chemical in our food? It’s only purpose is to reduce the acidity in foods which helps maintain color and uniform processing. And you guessed it: TSP is on the GRAS list. Sugar doesn’t rank high on a toxic chemical list. However, the American Heart Association recommends only “6–9 teaspoons, or 25–37.5 grams, of sugar a day” for adults and less than 25 grams, or 6 teaspoons a day for children ages 2-18. The scary part? Children ages 1-3 consume 12 teaspoons of sugar a day, 4-8 year-olds consume 21 teaspoons, and 14-18 year-olds consume 34.3 teaspoons of sugar in one day! High sugar consumption is linked to obesity, high blood pressure and type 2 diabetes. These diseases put children at risk for heart disease later in life. Sugar is used in cereals to enhance the taste and keep you (and your kids) coming back for more. But just think, your child could easily consume half or more of their daily sugar intake in just one bowl of cereal! Butylated hydroxyanisole acts as a defoaming agent for yeast and protects the processed fats from turning rancid, spoiling the food’s taste or color. Nobody likes stale, rancid, or funky-colored cereal, so this is the cheapest way to keep it all uniform. These three chemicals alone should send us running to our pantries with a trash bag ready to pitch all cereals that contain them. While you’re at it, keep an eye out for the hidden processing horrors of Genetically Modified Organisms (GMOs), hydrogenated oils, soy lecithin, dyes, and annatto, among other chemicals, that may land even more products in the trash. There has never been a more critical age than now to educate ourselves on what’s in our food! Ready to make a change to your morning routine? It’s not as daunting as it may seem! Try these alternatives for better energy, improved mood, and healthier lifestyle. Ditch the cereal route and add some variety to your breakfast. Health.com lists 20 best foods to eat for breakfast. Topping the list is oatmeal and greek yogurt, which are easy to personalize with fruit, nuts, or a touch of maple syrup or honey to cut back on the sugar. Eggs are also high on the list, with plenty of protein an nutrients to keep hunger at bay. A rainbow of fruits can also brighten your morning! Grapefruit, bananas, melons, and berries are all excellent additions to your breakfast that satisfy your sweet tooth. Still can’t resist the urge and ease of cereal? You’re in good company. The natural cereal aisles are exploding with new brands, flavors, and grain combinations. Most natural food brands are mindful of the origin or their ingredients and how much sugar are in their cereals, but always check for yourself! Nature’s Path, Envirokidz, and Erewhon top this list of best cereal alternatives for kids, with lengthy lists of best cereal alternatives for the whole family. We’ve all heard that smaller, more frequent meals is better for our bodies, minds, and budgets. This routine is worth taking a try, although it does take some planning. Keep healthy snacks like nuts and breakfast bars in the car, fruits and proteins in the fridge at work, and cut back on sweets to curb cravings. And remember–this isn’t an excuse to eat extra meals–portion control is key! It’s easy to stick our heads in the sand about where our favorite foods come from, but this will only be to our detriment. Conventional, processed foods lead us down a path of illness, and their toxins are in the very first things that pass our lips in the morning. Instead, choosing real food with real nutrients and in smaller portions can help us live happier, healthier lives.